Why do we keep telling myths? That is the question at the heart of “Hadestown,” a refreshingly inventive new musical by singer-songwriter Anaïs Mitchell. What’s the point of resurrecting superstitious writing from millennia ago? Why should we care about some long-winded tale of events, especially when they’ve been so ingrained in our culture? And if we do keep retelling the same myths, what are we trying to accomplish? “Hadestown” not only grapples with these questions but provides a resolution to them through its mere existence, making the ancient startlingly new again. “Hadestown” premiered off-Broadway at the New York Theater Workshop in the summer of 2016, and its live cast recording was released this past October. The show adapts one of the tales reimagined by Virgil and Plato: that of Orpheus and Eurydice. Orpheus is a mythical musician and singer set to marry Eurydice before she is stung by a snake and dies; his lyrical laments prompt a journey into the Underworld to restore Eurydice’s life. Hades, the god of the Underworld, agrees under one condition: that on the return journey to the world of mortals, Orpheus will walk in front of Eurydice and must not look back. He has to trust she’s walking with him. In knowing that this story is a tragedy, you can probably guess how things end. As the basis of an adaptation, this myth has hardly enough plot to be dramatized onstage, let alone developed into a two-act musical. Part of the exhilarating surprise of this new musical, then, is just how thoroughly Mitchell understands the impulses behind this classic story and how she spends time elaborating them into beautiful melodies. Working with Rachel Chavkin (director of Broadway’s “Natasha, Pierre & The Great Comet of 1812”), Mitchell transplants this epic tale onto the dusty backroads of the American South. Orpheus (Damon Daunno) becomes a Bob Dylan-esque crooner, a poet transformed into a songwriter, with a lyre transformed into an acoustic guitar. Other mythological characters help round out the cast, like the messenger god Hermes (Chris Sullivan), who narrates the show; Hades’s wife Persephone (Amber Gray), a rambunctious party-goer and confidant to both Orpheus and Euridyce; and the Three Fates (Lulu Fall, Jessie Shelton, and Shaina Taub), who harmonize taunts about the lovers’ predicament. The displacement of these classical figures into an American context allows Mitchell to explore this story with a vibrant set of folk tunes, whose lyrics slyly blend the ancient with the modern. Take the Act II opener “Our Lady of the Underground,” in which Persephone tempts the dead with artifacts of their past lives: “I’ve got the wind right here in a jar / I’ve got the rain on tap in the bar / I’ve got sun right up on the shelf / Allow me to introduce myself!” Gray is particularly delightful here, performing not only for her fellow cast members within the show but also for the audience (who you can hear applauding in the recording). Likewise, the directions Hermes gives to Orpheus for his journey to the Underworld integrate folksy slang: “How to get to Hadestown: you’ll have to take the long way down / through the underground, undercover at night / layin’ low, staying out of sight / There ain’t no compass, brother, ain’t no map / just a telephone wire and railroad track / you keep on walking and don’t look back / ‘til you get to the Bottomland.” Depression-era folktale storytelling becomes a natural vessel for delivering this myth, and encourages the specificity of lyrics that musical theater thrives on. Even if Mitchell’s songs never verge wildly into different genres the way Chavkin’s previous musical did (Dave Malloy’s score for “The Great Comet” included both avant-garde opera and electronic music), Mitchell’s score is wonderfully cohesive while still devoting time to different kinds of songs. 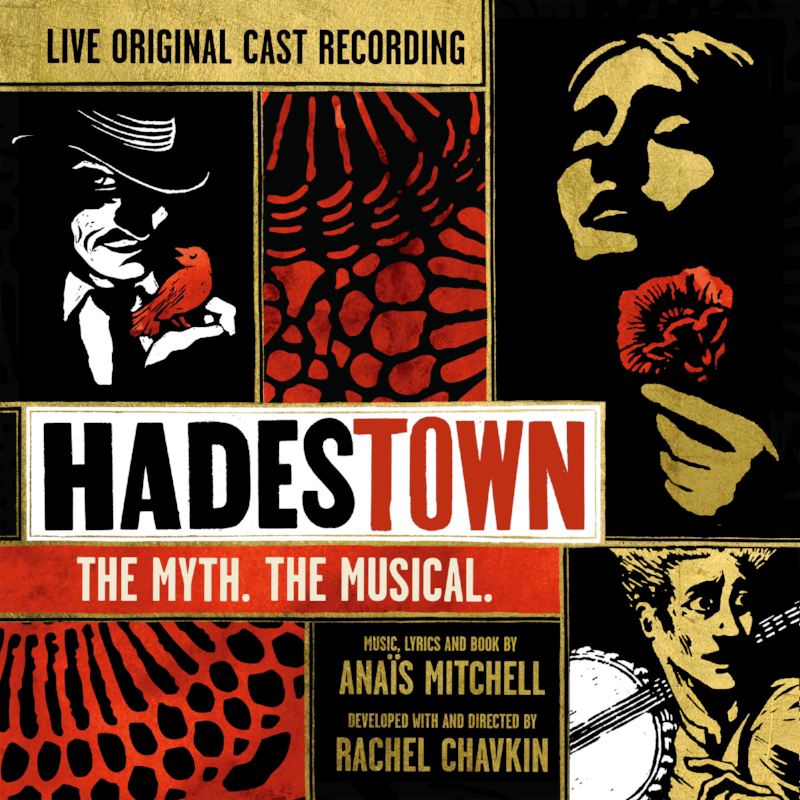 “All I’ve Ever Known” is a lush ballad about falling in love; “Way Down Hadestown” is a New-Orleans jazz funeral romp; “Chant” describes the humming, electric industrialism of the “neon acropolis” that is Hadestown with a continual percussive beat. Reprises of melodies are laced throughout the work, and while they seem repetitive at times, they tie the story together into a strong, unified piece of work. Most haunting of all is the “Wait for Me” melody, a musical torch song of devotion from Orpheus to Eurydice. This promise to a distant lover lingers throughout the show, returning to the score like a ghost. Our tenuous relationship to the melody is not unlike Orpheus’s relationship to his lover: simultaneously intimate and distant, affirming and aching. And yet, “Hadestown” is undeniably original within its political dimension. Wondering what becomes of Hades becomes essential, and how he runs his “town” within the show. You’re in for both a treat and some sorrow. Portrayed by Patrick Page, whose voice goes almost as low as the underground world he’s singing about, Hades becomes the beguiling tempter of Eurydice. Instead of Eurydice’s death being a tragic accident, the event becomes a pivotal choice for the character, closely resembling Eve’s choice in the Biblical Garden of Eden. In the musical, Eurydice becomes increasingly concerned for her well-being and dubious about her potentially delusional dreams of Orpheus. Singing sweet songs doesn’t pay the bills or put food on the table. In walks Hades, whose Underworld has been reconfigured into a booming industrial factory, a land of mindless labor and technological progress. He tempts Eurydice into “the comforts of a gilded cage,” and Eurydice now has the agency in deciding to die. It’s a clever narrative move, that repositions Eurydice’s death as both a betrayal of trust and a search for hope. Hades himself takes on many associations. He’s primarily a sleek businessman, but within the show’s various metaphors he also becomes a railroad conductor, romantic corruptor, eerily convincing demagogue, prison guard, slave keeper, and a king obsessed with the illusion of wealth. Forget being a god: in this musical, Hades becomes a shapeshifting Manipulator-in-Chief. If all of this sound a little too familiar, well, it should. The comparisons to today’s political climate are palpable, nowhere more explicit than in the Act I closer “Why We Build The Wall,” a jail-yard chant that explains the motivations of those toiling in Hadestown: “Because we have what they have not / Because they want what we have got / the enemy is poverty / and the wall keeps out the enemy / and we build the wall to keep us free / That’s why we build the wall / We build the wall to keep us free.” Hades has seized power in the Underworld by tempting souls with the promise of economic stability via the Wall, which is in actuality an endless project of division and exclusion. The economic desperation bleeding into discrimination here is a barely-veiled critique of the rise of Trump, or, at the very least, of the nationalism that’s currently consuming the world. And yet, “Hadestown” doesn’t fall into the trap that many pieces of art face when confronting Trump. Hades is not acted out as a straw-man satire with over-the-top mannerisms, and he isn’t necessarily the malicious villain of the story, either. If anything, Hades is a particularly effective businessman: selling people on an ideological dream, the illusion of grandeur, and profiting off their sincere faith in him, which in reality is only an illusion. He’s selling them down the river Styx. His actions are not acceptable, but they’re at least rendered understandable. The enemy of the show, then, isn’t Hades. It’s the lack of trust we place within each other. It’s what drives Eurydice to abandon her lover, Hades to stay frighteningly possessive of his wife, the denizens of the Underworld to help build the Wall, and, most importantly, the ultimate tragedy of the show, when Orpheus looks back at Eurydice, not believing she’s there. So what are we left with at the end of this musical? A resounding message that the only way to move forward is to trust each other, to trust the “enemy,” to believe that we’re following each other upwards out of the Underworld. By the musical’s end, Hermes asserts that the reason we continue to tell stories is an act of profound hope: the belief that perhaps the story will turn out differently. But after listening to “Hadestown,” one might add that, whether it’s about explaining natural phenomena or disseminating political messages, myth has always been an attempt at being able to understand the world. If this is true, then “Hadestown” is a stunning, and absolutely successful, modern myth. Nathan Pugh can be reached at npugh@wesleyan.edu. Yes the musical isn’t new actually. In fact, it was released as a concept album in 2010 on the label, Righteous Babe Records – also the label of Ani DiFranco, who performs on the album.